Virginia Attorney General Mark Herring issued an official advisory opinion on May 5 holding that Virginia localities have the right to prohibit hydraulic fracturing (or “fracking”) as part of their power to regulate land use within their boundaries. The letter reverses a two-year-old opinion by former Attorney General Ken Cuccinelli. But, Herring notes, the statute “also includes a savings clause stating that the Act does not ‘limit or supersede the jurisdiction and requirements of . 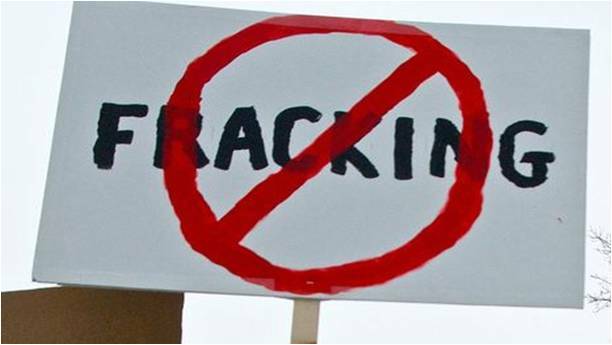 . . local land-use ordinances.’” Thus, it explicitly preserves local zoning authority to prohibit or limit fracking. Interestingly, if localities choose to restrict fracking but not prohibit it, they may actually leave themselves more open to challenge. 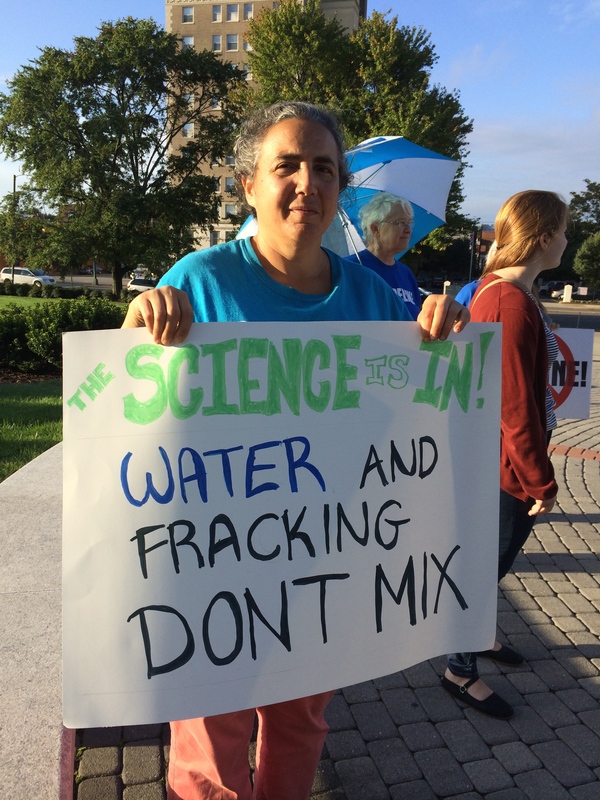 Herring’s opinion reaffirms that portion of Cuccinelli’s opinion that upheld the right of localities to impose some restrictions on fracking, short of outright prohibition. However, the restriction must be “reasonable in scope” and “not inconsistent with the Act or regulations properly enacted pursuant to the Act.” As a result, a fracking company might have a better shot at challenging a restriction than it would an outright ban. 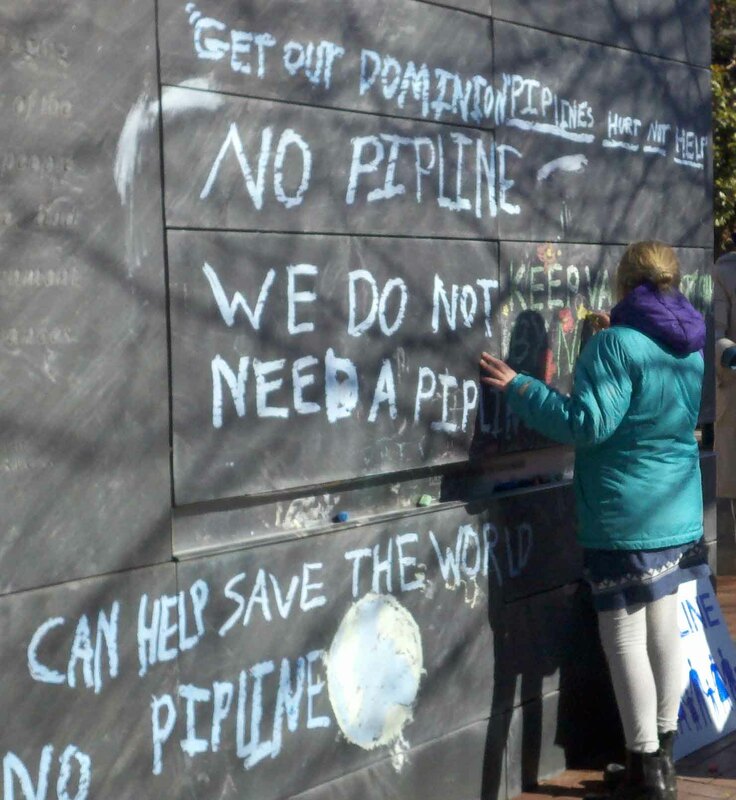 Opposition to Dominon’s planned Atlantic Coast Pipeline has spurred protests from landowners and environmental advocates and led to more than 5,000 comments to the McAuliffe Administration opposing the pipeline. Photo courtesy of Linda Muller. Dominion Resources and its regulated subsidiary, Dominion Virginia Power, are gambling big on natural gas. But while the utility giant will be a winner if gas prices stay low over the next 20 years, the risk of losing this bet is very real—and the risk is being borne disproportionately by Virginia consumers. Ever since the shale gas boom sent natural gas prices into a tailspin beginning in 2008, Dominion has increasingly been putting its chips into gas. Its Virginia subsidiary just completed a 1,329 megawatt (MW) natural gas plant in Warren County, began construction last year on a 1,358 MW gas plant in Brunswick County, and last month announced plans for a 1,600 MW plant in Greenville County, to be operational in 2019. Virginia ratepayers will foot the bill for construction costs, plus the cost of operating and fueling these mammoth plants for decades to come. But while Virginians tend to think of Dominion as an electricity provider, its bigger business line is in natural gas transmission and storage. According to the Dominion website, its subsidiary Dominion Transmission, Inc. maintains 7,800 miles of pipeline in six states and operates what it says is one of the largest underground natural gas storage facilities. Another subsidiary operates 1,500 miles of pipeline in South Carolina and Georgia. The company is moving aggressively to add and upgrade compressor stations and build additional pipeline capacity in West Virginia and Pennsylvania. It is also angling to add a massive 42-inch diameter, 550-mile gas pipeline to run from West Virginia through Virginia to the coast in North Carolina. Promising a vast new supply of cheap fracked gas for industrial users, Dominion has won the support of lawmakers like Virginia Governor Terry McAuliffe while galvanizing opposition from landowners and environmentalists. All of these ventures depend on one crucial assumption: that natural gas prices will remain low for as many years as it takes to fully recover the cost of these investments, and then some. For electric generation, moreover, gas has to be able to outcompete other fuel sources. That includes not just coal and nuclear, both of which are being abandoned in droves in the face of cheap gas, but also new sources like solar and wind, which have trended steadily downward in price over the past two decades. In some regions of the country (although not yet Virginia), wind and solar prices already outcompete natural gas. Gas does have the advantage of dispatchability—the ability to provide power according to the peaks and valleys of demand, allowing it to fill in around variable energy sources like wind and solar. That makes gas vital for backup generation, at least until power storage technologies become cheaper. But it wouldn’t justify the large-scale shift to gas for baseload generation, as Dominion’s plans envision, unless the company is right that gas prices will stay low. If Dominion’s assessment of the market is wrong, its shareholders will take a hit. Higher natural gas prices could make the export business fizzle, and there might not be enough customers to justify the pipeline buildout. That’s why the company is moving so quickly to build the three massive new natural gas generating plants in Virginia under the ownership of its regulated subsidiary. Dominion is protecting its bet by locking Virginia electricity customers into gas for the long term, guaranteeing itself a market not just for its natural gas generating plants but also for its pipeline business. If the shale boom becomes a bust, or if prices rise to pre-boom levels, it will be Virginia ratepayers who pay through the nose or get stuck with stranded assets. How big the risk is depends on whom you ask. The gas industry claims supplies will be sufficient to meet demand for decades to come. The U.S. Energy Information Agency, that voracious consumer of yesterday’s news, largely agrees (though it has more recently begun tempering its enthusiasm). If the optimists are right, production from the major shale gas plays will increase 40% by 2030 over today’s production levels, enough to support the mad rush to gas by Dominion and other utilities like it, without upward pressure on prices. But a more pessimistic view is gaining adherents. As described in the December 2014 issue of the journal Nature, a team of a dozen geoscientists, petroleum engineers and economists at the University of Texas at Austin (UTA) has been analyzing assumptions behind the industry’s rosy outlook, and concludes it is wrong. Instead, the UTA study indicates production of natural gas from the “big four” shale plays will slow significantly after 2016, peak by about 2020, and then decline, dropping 20% from current levels by 2030. If so, the amount of natural gas coming to market in the U.S. will be less than half of what the optimists expect. The upward pressure on prices will be enormous. The UTA team joins a growing chorus of doubters, whose studies suggest that the shale juggernaut can’t be maintained profitably. If these pessimists are correct, we should begin seeing evidence of it well before 2020. For now, there is at the least a very serious risk that cheap gas won’t last, and anyone who can’t afford to lose big would be well advised to wait it out. With pollution of air and water a serious concern, and given the state’s tradition of lax regulation on industry, some localities are already looking for ways to exclude drilling companies from their borders. If we are going to have this fight, it shouldn’t be because one powerful corporation made a bad bet. Finally, of course, there is the climate cost of natural gas. As we congratulate ourselves for leaving coal in the rear-view mirror, we need to recall that we have a long way to go to reach the carbon-free grid, and stalling out at the halfway point isn’t grounds for celebration. Natural gas has a role to play in the transition period before wind, solar, and other carbon-free sources take over permanently, and it will remain useful as a back-up source when wind and solar aren’t producing power. But a wise energy policy today focuses on developing those renewable sources as fast as possible, reducing demand through investments in energy efficiency, and using natural gas as a backstop rather than as a primary source of power. This approach reduces risk to the national economy if shale gas production declines, and it reduces risk to ratepayers stuck paying whatever the price of natural gas may be when demand outstrips supply. Dominion Resources is an investor-owned corporation. As such, it is entitled to place risky bets in the hopes of making a killing for its shareholders. What it is not entitled to do is to shift the risk of losing the bet onto its captive ratepayers in Virginia. With the odds so stacked against consumers, Virginia should refuse to play. Thanks go to Richard Ball, PhD., Energy Chair of the Virginia Sierra Club, for his research and analysis of shale gas supplies.